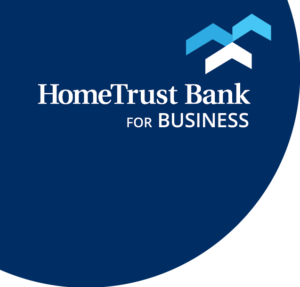 In celebration of the HomeTrust Bank 90th anniversary, the bank is continuing its commitment to the communities it serves by investing in local organizations. Through the 90k for 90th campaign, HomeTrust has donated $90,000 during the month of May to community organizations that assist with affordable housing, financial literacy, community enrichment, and culture. The public assisted in the selection process by voting on the HomeTrust Bank Facebook page to determine the distribution of the $90k in gifts across North Carolina, South Carolina, Tennessee, and Virginia. HomeTrust Bank CEO, Dana Stonestreet, presents the check for first place in Buncombe County to OnTrack WNC at their Financial Literacy Luncheon. Anna Zanetti, North Carolina Director of Friends of Great Smoky Mountains National Park, accepts the first place check in Haywood County from HomeTrust Bank employees Bria Davis, Tina Ramsey and Jim Darby. HomeTrust Bank Branch Managers, Sonja Laughter and Peggy Orr present George Alley, Executive Director of Thermal Belt Outreach with the first place check in Polk County. HomeTrust Bank team members, Melissa Thompson, Jerry Johnson, and Jeff Condrey, present Debbie Smith from the Sisters in Christ shelter with the winning check for Rutherford County. HomeTrust Bank team members Bridget French, and Johnathan Jobe present Rockingham County Literacy Project with the first place check in Rockingham County. Market President, Bob Callicutt presents the board of directors of Lexington Housing Community Development Corporation, with the winning check for Davidson County. HomeTrust Bank Branch Manager, Lydia Shirley presented the Greenville region first place check to the staff and board of directors of Junior Achievement of Upstate SC . HomeTrust team members Kelly Vittatoe and Trey Coleman present the first place prize in the Knoxville region to the board of Young-Williams Animal Center during their monthly meeting. 3rd Place: Eastern Eight Community Development Corp. The Southern Appalachian Ronald McDonald House was presented with the top prize of $7500 in the Tri-Cities region by HomeTrust Branch Managers, Tanya Tisor and Kort Boring. Adam Shores, Virginia Market President, presented a check to Roanoke Ballet Theatre for winning first place in the Roanoke region.